The Social Media Conference informs attendees of all areas of social media – from tips and tricks for attractive posts, to video, photography, and marketing strategies. This year’s event featured a panel discussion with Dawn Mosley of IAM Film Works, Mac Nagaswami of Carvertise, Doug Yorke of Dover International Speedway, and Marcus Watkins of United Way of Delaware. Some of the 15 breakout sessions were led by Janelle Mazur of Dogfish Head Craft Brewery, Caroline Judge of SoDel Concepts, Chris Rausch of the Cape Gazette, John Paul Lacap of the Milton Theater, Elizabeth Keller of Delaware Tourism, Courtney Hastings of the Hertrich Family of Automotive Dealerships, to name a few. This conference is for small business, non-profit, big business, and everyone in between – and attracts the top social media marketing experts from around the region. Attendees gain the mindset, tools, and skills needed with social media and bring in positive ROI (return on investment) from each effort. The 2020 Social Media Conference is scheduled for March 5, 2020. For more information, visit dtccsmc.com and follow the Social Media Conference on social media at Facebook.com/dtccsmc, @dtcc_smc on Twitter, and @dtccsmc on Instagram. Top: The 2019 Social Media Conference on March 7 featured a panel discussion by, from left, Marcus Watkins of United Way of Delaware; Dawn Mosley of IAM Film Works; Natalie Hines of Delaware Tech who served as moderator; Doug Yorke of Dover International Speedway; and Mac Nagaswami of Carvertise. 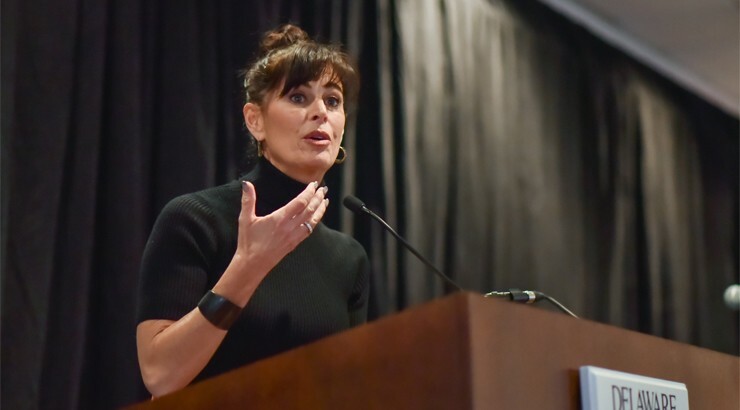 Bottom: Michelle DiFebo Freeman, owner and CEO of the Carl M. Freeman Companies, was the keynote speaker at the 2019 Social Media Conference.